The Revisionist Stage explores the vision and talents of a controversial group of artists who, depending on one's perspective, either revitalized or disfigured the standard dramatic repertoire by adapting canonical dramas for the contemporary American stage. Amy S. Green's critical history features the bold directorial ventures of JoAnne Akalaitis, Lee Breuer, Liviu Ciulei, Richard Foreman, Joseph Papp, Lucian Pintilie, Richard Schechner, Peter Sellars, Andrei Serban, Robert Woodruff, and Garland Wright. Green covers Greek and Roman drama, plays by Shakespeare and Molière, and the operas of Mozart and da Ponte, and discusses in detail many landmark theatrical events of the past thirty years. This versatile, insightful study provides an informed reading of the business of theatrical revision, and a full-scale investigation of this rich and controversial genre. "...The Revisionist Stage is a useful and important book. It is an essential guide to the theory and practice of performing classic plays in the late twentieth century. ...a model of critical openess." "...the book is well written, meets its stated goals, and includes detailed notes and bibliography. It will prove most helpful to those interested in 'bright ideas'." "...Amy S. Green has taken on a sizable task with apparent ease and much grace...[an] insightful look at some of the most noteworthy U.S. productions of the past three decades. Green's work is both theoretically and historically grounded and her excellent synthesis of wide-ranging materials into highly evocative descriptive prose contributes significantly to the body of information available about the theatre of this period in the U.S."
"...the book is a worthwhile addition to the study of production." "In the most important work on the Brooklyn Bridge in a generation, Richard Haw shows how and why it remains a central but contested American icon." "Absorbing and provocative, Richard Haw sells you the great bridge in a thousand incarnations." "Richard Haw's book is an ecstatic ode to the Brooklyn Bridge, which we all know is so much more than its 14,680 tons of wood, stone and steel. Its all in here: the builders and bigwigs, the Roeblings and the riggers, the jumpers and joggers, the painters and poets. Rare images and fascinating text memorialize the odd jumble of characters without whose brains, brawn, and chutzpah the bridge might never have been built. This marvelous book shows why we say Brooklyn is the place where legends are made and dreams come true." "Art of the Brooklyn Bridge is an elegant structure, which takes you to another shore and along the way offers unparalleled views. Richard Haw's beautiful book is about one of the worlds great bridges, but also all about the city that makes it great." "Richard Haw's magically illustrated cultural history of the Brooklyn Bridge is a most welcome celebration of one of the greatest engineering achievements of all time. Art of the Brooklyn Bridge is a visual and literary delight." "Richard Haw's Art of the Brooklyn Bridge is irresistible. Delightfully written, it presents a fascinating gallery of characters associated with the Bridge through its history. But the book is much more than that. It is packed with rarely seen and many never published images of the Bridge, from newspaper and magazine engravings, to movie posters, to major paintings and some of the most compelling photographs of the Bridge I have ever seen. Haw is a wonderful story teller and he is blessed with an eye for the humorous as well as the aesthetic. He reveals the Bridge as an icon, muse, and obsession for New Yorkers." "Richard Haw is our greatest chronicler of the Brooklyn Bridge. He has dug deeper than the usual treatment of the bridge as technological triumph and cultural icon to see it as a psychological fact and witness to changing times, as represented by the stunningly varied artists and photographers drawn to the bridge. 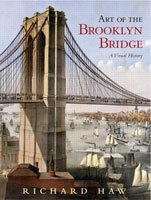 This book is also the most compelling compilation of Brooklyn Bridge images I have ever seen." After nearly thirty years in the public eye, Arnold Schwarzenegger's rise to fame and fortune--and statesmanship--represents a celebrity the likes of which we've never seen before. As co-authors and longtime collaborators Blitz and Krasniewicz argue in this humorous but heady book, it is not just a matter of his transformation from bodybuilder to megastar to politician. Nor is his governorship of California just a matter of another actor assuming the position. Instead, at the beginning of the 21st century, "Arnoldness" has spread into every corner of our culture. More than a name, more than a spectacular career, he has become a set of ideas--an ultramodern take on the quintessential American dream.Having followed the cult of Arnold for twenty years, Blitz and Krasniewicz are uniquely qualified to illuminate his growing hold on our collective imagination. As an adjective, as a metaphor, as an easy reference point for anyone talking about things tough, forceful, and successful, they'll explain exactly why Arnold matters--and for better or worse, richer or poorer, America may never be the same.